A few interesting things I forgot to put in my post on Climbing the Lost Arrow Spire. If you hunt around on the internet in various nooks and crannies you’re bound to find a lot more. Lost Arrow Spire, Tyrolean Traverse from Mark Smiley on Vimeo. Mark and Janelle Smiley doing the Lost Arrow tip and Tyrollean traverse back. 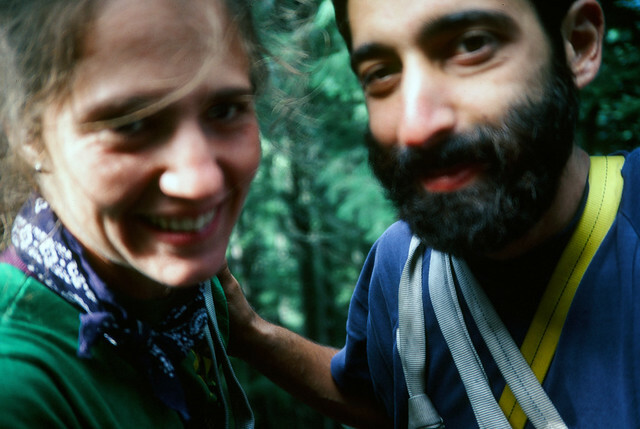 The Smiley’s are an adventurous couple and worth following: Blue Square Productions. Here is a collection of their excellent videos. Here’s a blog post by ? And Shirley Choss that documents this couple’s climb of the Lost Arrow Spire and Tyrollean traverse to get off. It’s 2004 so not super up to date but a lot more up to date than my 1976 climb: Lost Arrow Tip. They’ve done a lot of climbing all over the world over many years: Choss climbing images. This is an incredible achievement. It’s a landmark in the history of rock climbing. Honnold is an exceptional climber and has free soloed (no rope or other equipment) many difficult routes before but this route is in another category. I climbed the Nose Route on El Capitan in the late 1970’s in slightly slower than what was then the regular time: 4 days (an extra day) and with about half the climb using aid (using gear to advance, not just protect a fall). The route Honnold has done is much harder than the Nose route and he’s done it free solo. Freerider is a variant of the Salathe Wall route put up by the recently deceased Royal Robbins in 1961. I’m a long retired climber but I’m interested in how the sport has advanced over the many years since I did it. This is a very large advance. One of the fathers of modern rock climbing, Royal Robbins died on March 14, 2017. Somehow this news escaped me and that fact has been bothering me for the past few weeks since learning about it. I haven’t climbed in over thirty years but I can say without a doubt that Royal Robbins influenced my climbing more than anyone. Actually, he influenced more than my climbing, he influenced my life. Robbins wrote two small but extremely influential books that remained the instruction manuals for climbing for many years (they’re dated now although collectors items): Basic Rockcraft and Advanced Rockcraft. What these books have in common is an emphasis on process: getting to the top is less important than how one gets there, clean climbing (at the time we were moving away from pitons), spare equipment to save weight and keep things simple, and, most importantly for route pioneers, finding routes that follow crack systems and have an aesthetic sense about them (as opposed to bolting straight up a face). Robbins’ nemesis, Warren Harding played the wild, bad guy to Robbins’ good guy. Truth be told, they both pioneered great routes in Yosemite although in very different styles. Another thing these books have in common is that they are illustrated with great humor by Sheridan Anderson (best known for The Curtis Creek Manifesto one of the best fly-fishing books ever written). Without Anderson’s illustrations the books would have fallen flat, very much like the collaboration of John Muir (writer) and Peter Aschwanden (illustrator) in How to Keep Your Volkswagen Alive: A Manual of Step-by-Step Procedures for the Complete Idiot (also called “the Idiot Book”). I’ve used Anderson’s drawings of Robbins to illustrate this post. Note that Robbins routinely wore a white flat cap and Anderson’s illustrations usually have him in glasses and said cap. Robbins used Yosemite Valley as his climbing laboratory because it has stable weather, and large, glacier-carved cliffs of incredible exfoliated granite with crack systems that make building spectacular routes possible. He climbed all over the world but Yosemite remained his home base for much of his climbing career and his particular methods and style are aimed at the type of rock climbing found there. I got into and almost out of climbing before Steve Jobs and Apple came out with the Macintosh but Jobs and Robbins had something in common besides both being from California: they both worshipped process. As an undergraduate at the University of Oregon Fine Arts department I used to hear: “the process is the product” which is another way of saying what Steve Jobs said about building the Macintosh: “the journey is the reward” which is another way of saying what Robbins said: how you get to the top is more important than getting to the top. This meme has been a running idea in my life since first encountering it in the early 1970’s. Robbins “put up” (made the first ascent) on hundreds (thousands?) of climbs but what marked and marks his climbs is that they, for the most part, have become classics: people want to repeat them because they’re beautiful, fun, and interesting. The one Robbins climb that most aspiring rock climbers have to do is called Nutcracker. It’s on a cliff known as Manure Pile Buttress (seriously) and while it’s not as epic as something like The Northwest Face of Half Dome (another Robbins first ascent), it’s a great climb of moderate difficulty. Robbins and his wife Liz first climbed Nutcracker in 1967 and it was the first climb of any significance that was done without pitons: Robbins only used wedges of aluminum on slings called nuts stuffed into cracks to protect the climb, thus the name (a first ascender gets to name the route and Robbins was known for having fun with route names). In the history of climbing without pitons, the thought is that British climbers approaching cliffs beside railroad tracks picked up steel hex nuts, passed pieces of rope through them and used these like chockstones to protect climbs. When Yvon Chouinard (another Yosemite pioneer and founder of Patagonia) heard about this he decided to make irregular hexagonal shapes out of aluminum which in my day, we called “hexes” for climbers to stuff into cracks instead of pitons. These days there are still stoppers, wedges, and hex nuts although they’ve been all but replaced by expandable protection. The fact that Robbins and his wife did this climb without pitons in 1967 was significant and it led to a push in Yosemite Valley to do away with pitons all together, even on longer big wall routes. 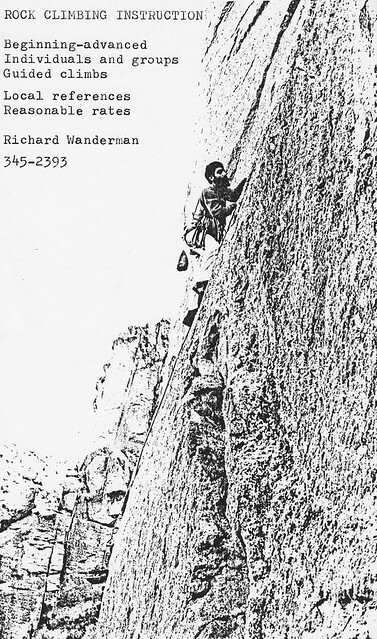 I first climbed Nutcracker in 1975 with my friend Rod Orlando (image on the left with me leading) and climbed it numerous times in later years with a variety of partners. I loved that route and even as I started climbing longer and more serious routes, I almost always came back to Nutcracker. It was like paying my respects to Royal Robbins, a pioneering climber who was one of my role models. For more on how Robbins fits into the history of climbing in Yosemite, I highly recommend the movie: Valley Uprising. Valley Uprising on Netflix. Valley Uprising on Amazon. There is overlap in the obituaries but they’re all worth looking at as they each have a slightly different take on Robbins’ life. If you’ve got a great source, please post it in comments, I’ll add it here. Thanks. Swiss climber Ueli Steck was killed in a fall on Mt. Everest today. 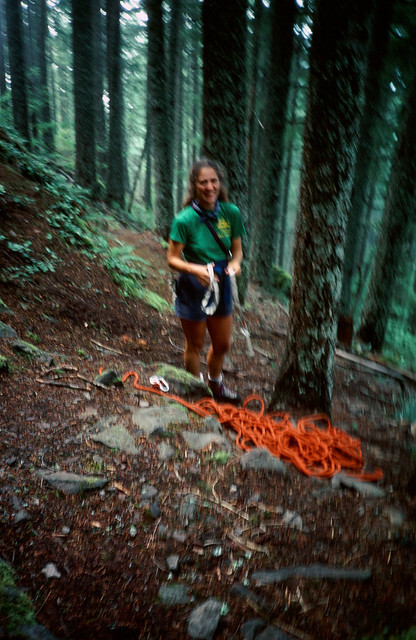 Steck was one of the greatest mountaineers and all-around climber-athletes in the world. He was skilled and experienced enough so that an accident like this would be unlikely for him, however, free solo climbing (climbing alone without a rope) is dangerous, even for someone as skilled as Steck. I’ve followed Steck’s career for a while, mostly because he’s an interesting guy, and also because those of us who were or still are climbers know what The Eiger North Face is and Steck not only free soloed it, he did it numerous times in under 3 hours. This is an incredible achievement because of the skill and daring involved but also because of the endurance involved. Steck was called “the Swiss machine” for a reason: he had tremendous endurance. I posted about him here in 2011. Below is the video from that post. Warren Harding in Portland, Oregon in 1979. You may have followed the story of Tommy Caldwell and Kevin Jorgeson doing the first free ascent of El Capitan’s Dawn Wall in Yosemite Valley but with all the media buzz the pioneer of that route and it’s controversial history seems to have gotten lost (not by Caldwell and Jorgeson, by the media and the public at large). To understand what Caldwell and Jorgeson have done in context, one needs to understand how climbing works. Free soloing is climbing without a rope or any protection. Free climbing (what they did) is using a rope and a variety of gear to climb safely up a wall. If either party falls, the rope and belayer is there to catch them. Aid climbing is standing or hanging on the gear to make progress, also tied into a rope. Almost every route on El Capitan was first climbed with mixed free and aid climbing. As climbers have acclimated to doing harder things on big walls, at least partly because ropes can now absorb multiple falls without failing or hurting the person falling, climbers have started free climbing pitches on climbs that were once climbed only with aid. Climbers are more willing to risk a fall when they know the gear will protect them. When the Dawn Wall was first climbed aid was used on almost every pitch. Over many years, things have changed such that Caldwell and Jorgeson have climbed the entire route without the use of aid. The first person to climb El Capitan by any route was the late Warren Harding and the route he pioneered in 1958 was at the very prow of the huge cliff and he named it The Nose. He climbed it “expedition style” in 47 days over a period of a year and a half with a variety of partners (most climbers were freaked out to go up there and Harding himself scared them). He’d go up, explore a few pitches (rope lengths), leave some gear hanging there, then come down and rest up as well as get drunk (he was a drinker). I suppose this article could be titled “The Conquest of El Capitan”. However, as I hammered in the last bolt and staggered over the rim, it was not at all clear to me who was conqueror and who was conquered: I do recall that El Cap seemed to be in much better condition than I was. In following years, another Yosemite pioneer Royal Robbins did the Nose Route with Joe Fitschen, Chuck Pratt and Tom Frost in a continuous push over seven days. When I was in Yosemite, the Nose route was routinely climbed in three long days with mixed free (up to 5.10) and aid climbing. One of the best ways to see what climbing El Capitan looked like during my time there is to watch the film: El Capitan which was shot in 1968. 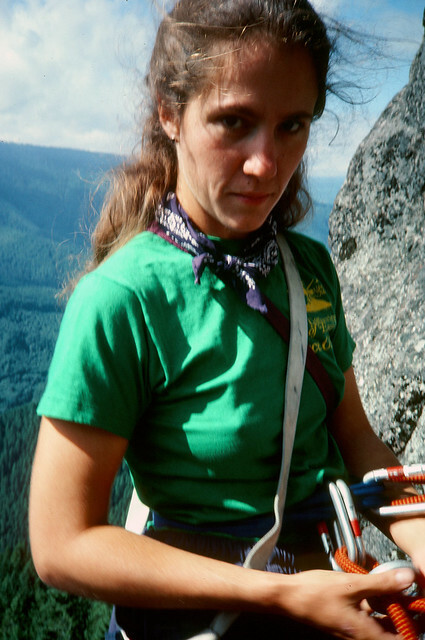 The Nose route saw its first fully free ascent in 1999 by Lynn Hill. Hill’s accomplishment is probably one of the most significant steps toward what Caldwell and Jorgeson have recently done. The Nose Route is the most popular big wall route on El Capitan and while modern climbers have honed the style by which it is done, Harding pioneered the route and got over what was a huge psychological barrier. By 1970 there were many routes on El Capitan pioneered by a variety of Yosemite climbers and earlier routes were being repeated with more free climbing and with faster times. In 1970, Warren Harding and Dean Caldwell (not related) decided to climb a relatively blank section of El Capitan to the east of the Nose Route where the sun first hits the cliff each morning. Harding named it: The Wall of Early Morning Light. No one was interested in this seemingly contrived route: it didn’t follow natural crack systems but instead, followed acres of blank wall. This appealed to Harding (probably at least partly because others disliked it) and he and Caldwell decided to do the route in a single push from the ground. Harding invented the “bat tent” (covered hammock) for this route as there were no ledges to rest or camp on. In order to get over the blank sections Harding drilled holes (with a rawl/hand drill) and pounded in hundreds of expansion bolts. The over-use of these was considered bad form by most of the Yosemite elite climbers, especially Royal Robbins who was irritated by Harding’s renegade attitude. With bolts you can climb anything by brute force and this was counter to Robbins’ idea that it wasn’t about getting to the top, it was the style in which you did it that mattered most. The climb took 27 days and in the middle of it, during a storm and with no communication with the climbers the Park Service organized a rescue which was rejected. When Harding and Caldwell topped out the media was on top waiting for them, something that had never happened before. This pissed off Royal Robbins who no doubt thought other, more aesthetic climbs done by more wholesome climbers deserved media attention, not this contrived bolt ladder done by Harding. Robbins decided to take decisive action and went up on the route with the intention of erasing it by chopping out the bolts. Once he got part way up he realized that Harding had put up another masterpiece and even though it was done with what Robbins considered too many bolts, the route was a great one and Robbins thought it should remain intact. Over many years those bolts have been replaced and the route’s name has been shortened to the Dawn Wall. Tommy Caldwell, who has no doubt climbed every route on El Capitan and is considered one of the best rock climbers in the world, decided to attempt to free climb the Dawn Wall and over many years he worked out the moves and on this latest effort along with Kevin Jorgeson he did it in one, continuous push. Harding died in 2002 but I’m guessing that wherever he is, he’s delighted that his route turned into the hardest free climb in the world. This entire history is beautifully documented in the film Valley Uprising which I highly recommend. I never climbed with him, but, considering that it’s Harding, I had a more classic (if not classy) one-time episode with him – I got stinking drunk with him (and a few others) at the Telluride film festival in 1985. Might have been the high point of my climbing career, although he barely remembered me the next day. I recently scanned over 400 slides. I shot most of them on movie reversal film I bulk rolled to save money. The upside was I saved money. The downside was and is, they’re not in great shape compared with the (few) Kodachrome slides I shot. I recently had them all scanned with ScanCafe and while my slides were a mess (very dirty) the service did a good job on them. This is the first of many posts telling some of the stories the slides illustrate. What I’ve learned in looking at these scans is that in order to tell a story you don’t need a perfect image, just a good enough image to illustrate the story. Of course, it’s only in retrospect that a story can be built out of images like these. Interesting to think about going forward. 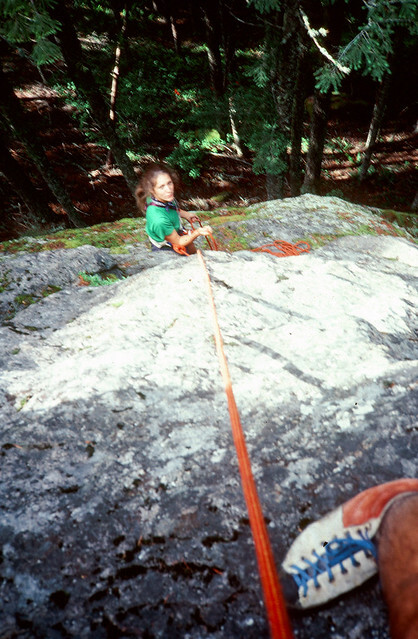 In the late 1970’s I got deeply into rock climbing. I started small and local in Eugene, Oregon and eventually did quite a bit of climbing all over the Northwest and in Yosemite Valley, California. Those were great years and I’ll be posting lots of images from many of the climbs I did back then. I shot most of them with one of two Olympus XA cameras I had back then (a fixed prime lens clamshell compact rangefinder camera). 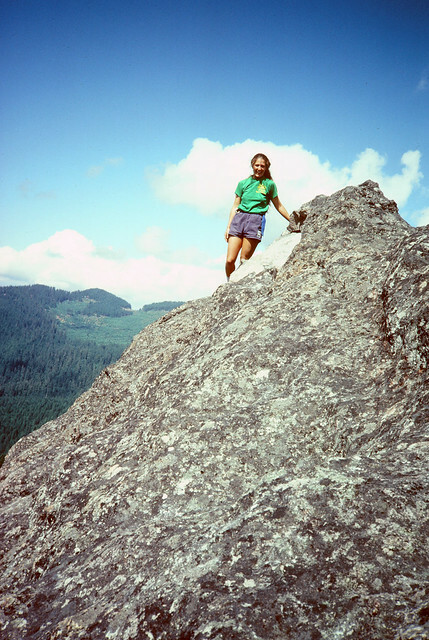 I taught climbing classes for the Eugene, Oregon Parks and Recreation Department and did a bit of private guiding on routes too remote or difficult for classes. In 1981 I dropped out of the climbing scene and pretty much everything else for a while to try to get to the bottom of a problem I’d had my entire life: dyslexia. In those days I wasn’t much of a multi-tasker: I found it difficult to do the work I was doing researching my reading and writing problems and at the same time carry on the rest of my life, so, I stopped everything until I got a handle on the reading and writing problems. 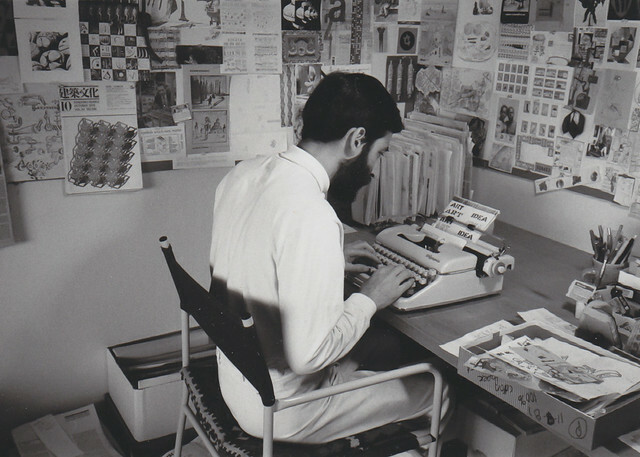 Richard writing on his Olympia manual typewriter. One of my most significant early tools was an Olympia manual typewriter. It solved my handwriting problems completely and for the first time in my life I could read my own writing. And, it allowed me to write without pain in my hands from bearing down too hard. But, the typewriter was just the beginning. When I came up for air in 1982 I decided to put an ad up at the local climbing spot that I was guiding again. I needed money and for me, this was a way to make some. Not long after I put up the ad I got a call from a women named Julia King. She had been on a mountaineering expedition on Mt. Jefferson in the Oregon Cascades and had watched as her then boyfriend slid down a snowfield to his death. That had shaken her up so badly that she got out of climbing. She wanted back in and wanted a gentle instructor to take her up a climb to break the ice. We made a plan to drive up to a climbing spot called The Menagerie which is a collection of odd shaped rock formations in the western foothills of the Oregon, Cascades. 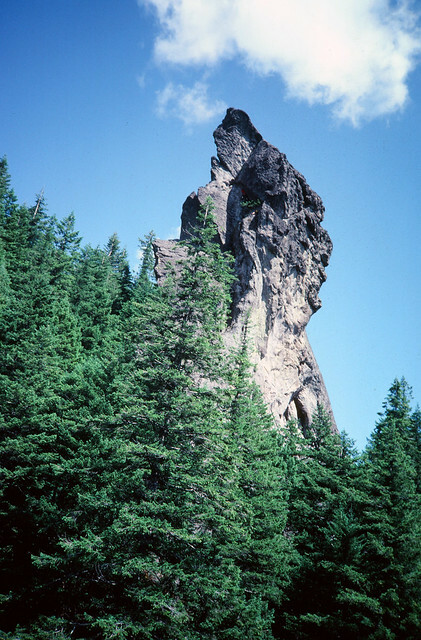 The formations have names like Rooster Rock, Chicken Rock, and Hen Rock. The most well known climb there that I’d done numerous times was on Rooster Rock and that’s what Julia and I planned to start off with to see how she did. We drove up to The Menagerie and hiked in to Rooster Rock. To be honest, even though I made this trip many times I have no memory of the various logging roads, trails, or route finding to get to this place. But, in those days I knew it all well. I carried a rucksack with a small rack of gear and we probably only brought a single rope as the rappel off of Rooster rock is short on the uphill side. I have no particular memory of this but it’s a long enough drive so after picking Julia up, we had a few hours in my VW bus to get to know one another. Knowing what I know about her now, my guess is the conversation was wide ranging. Even though I’ve not seen Julia in 25 or more years, she remains one of the most interesting and brilliant people I’ve ever known (my wife has met her and agrees), but, I didn’t know any of this then, just that we were off for a climbing adventure and I was hoping to make it as much fun and as easy as possible for her. Julia King sorting slings and flaking rope under Rooster Rock. The climb was uneventful as I remember it thirty two years later. Julia had climbing experience and knew about rope handling and belaying. Still, she was nervous and that meant I did a lot of talking to reassure her that I was well aware of her and taking good care of us while I led and she followed. This climb was probably two pitches with a belay on a ledge between them although there are many routes on Rooster Rock and I don’t really remember which one we did. No doubt an easy one. Looking down at Julia belaying while I led the first pitch. Julia setting up the belay for the second pitch. At the top we sat on a ledge and had some food and water and talked both about her experiences climbing in Oregon and trekking in Nepal and my experiences of the past few years coming to terms with dyslexia. Julia on top of Rooster Rock. In our discussion Julia mentioned that she thought that given the types of problems I was having with writing, writing with a computer would solve some problems for me. This wasn’t the first time I’d heard about the effects of editing text electronically, but Julia explained what she thought would make it work for me in a way that was both clear and convincing. She said that her then boyfriend Greg Estes had an IBM PC and I should stop by their house when we got back to Eugene to try writing with it. I don’t remember talking much more about this on our walk out and drive home. Climbing is an exciting thing to do and the purpose of our trip was to get Julia over her fear and it seemed like we’d done that. She was extremely happy which made me happy. And, I was happy that after a period of time away from climbing I could still climb well and safely lead someone up up a moderate climb. Most importantly, I’d met an amazing person who would remain my close friend for many years to come. I can’t remember if I went to their house and tried Greg’s computer that very day or a day later but it was very soon after we returned to Eugene. 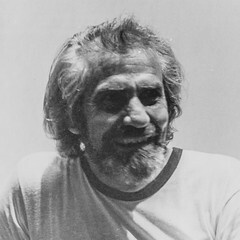 Greg Estes was a DBase programmer who wrote and published a magazine called Programmer’s Journal which Julia helped edit and lay out. They’d both trekked extensively in Nepal where they met and they were both my kind of people: informal, well informed, easy going, and worldly. After meeting Greg, he booted up his IBM PC (no hard disk or PC AT yet) and put in a disk with a simple writing program on it. He typed in the command to launch the program and backed away from the computer, leaving a green screen with a flashing cursor and a keyboard. He told me to sit down and type something out on the keyboard. At this point you should know that even though I could tell right away that there was little chance of humiliating myself in front of these people, I was petrified, not of the computer, but of exposing anyone else to my spelling and writing. Even though I’d spent the previous two years hunting and pecking on a typewriter and my writing had improved tremendously during that time, it was still crude and I was still sensitive about it. I wish I could remember the first sentence I wrote but it might have been something like, “hello my name is Richard.” Whatever it was I made a few mistakes which was good as it gave Greg something to teach me with. He told me to use the arrow keys to back the cursor up (the term cursor was new to me at that point) and put it just after the problem I wanted to fix, then use the backspace key to delete the problem letter and type the correct letter, fixing the problem. Anyone reading this in 2014 takes all of this for granted and has for decades, but back then only a small number of people had experienced electronic editing and they tended to be of the nerdy persuasion. Greg talked me through a bit more writing and editing doing a few different things, then he sat down and demonstrated some other things which blew my mind. We’re talking rudimentary word processing here, nothing fancy. But in those days just a “block move” (cutting and pasting) was a big deal. Writing with a pen or a typewriter is very much like sculpting stone, the consequences of making a mistake involve a complete rewrite. Writing with a computer is very much like working with clay because writing/editing and printing are separate pieces of the process, the consequences of making a mistake are eliminated because the writing remains plastic and editable at all times. Note: I have both a BFA and an MFA in ceramics and while I was pretty much done with ceramics at that point, working with clay remained and remains an important piece of my life. I would later go on to write numerous articles about “mistake tolerant tools and processes” comparing older analog tools with their newer digital counterparts. I had a gut feeling about this that very first day but it was unformed, just excitement and wonder. We had dinner, talked more about it and about lots of other stuff and Greg offered to help me if I decided to get a computer. It was an incredible evening. In the next few days I went to my local bookstore and did some research and poured through The Whole Earth Catalog which was just beginning to mention computers and got a copy of Peter McWilliams’ The Word Processing Book. In the end, I decided to get an IBM PC, MS DOS and WordStar mostly because I had Greg as a local resource and I really liked him. Once I got set up using my new computer one of the first things I did was a lot of enthusiastic writing on what it was like to write with a computer. 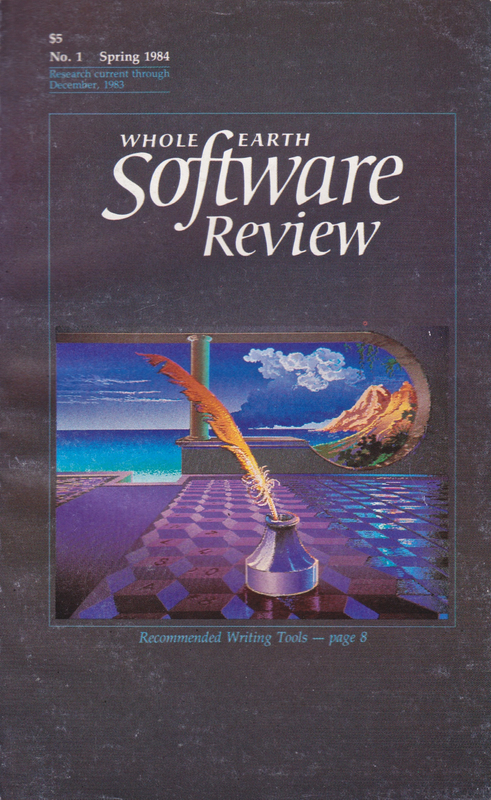 I did a piece for The Whole Earth Software Review, Issue #1, Spring, 1984: Word Processing Computers as Remedial Writing Tools. I also did a piece for the June, 1984 issue of Softalk for the IBM PC Personal Computer: Bridge to Clarity, the computer as a compensatory writing tool. 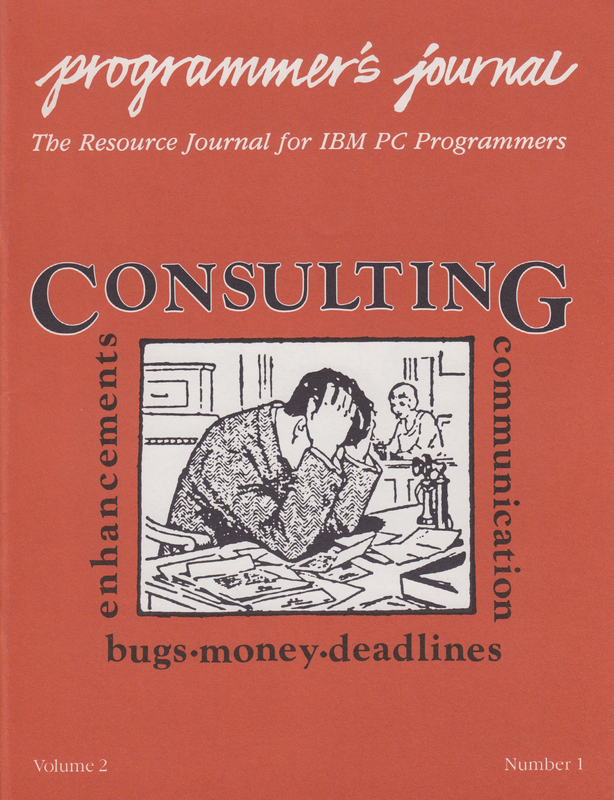 And I did various software review pieces for Greg and Julia’s magazine, Programmer’s Journal reviewing various writing and editing software for the IBM PC. I did a lot of other writing as well, some of which was published in both tech and learning related magazines I’ve long since forgotten. Greg was a member of the Eugene IBM PC user’s group (he may have started it) and I joined up for a while as well. During this time a woman named Norma Fuller who lived near Anchorage, Alaska read one of my pieces and called me up to see about bringing me up to Alaska to do a series of workshops for a group of dyslexic adults there. I taught there numerous times and made a great connection with her and others in Alaska (that will be another post with more scanned slides). During the first few years I got involved with computers I was not only writing about my experience as a dyslexic writing with a computer, I was also trying out lots of writing and spelling/grammar support software which was pretty crude in those days compared with what it’s like now. During one of my trips to a computer store in Eugene, I got to play around with Apple’s new Lisa computer. I wasn’t quite sure what to make of it but it was definitely interesting. At $10,000 it was far out of my reach but it did get me thinking about another way of using these new tools. 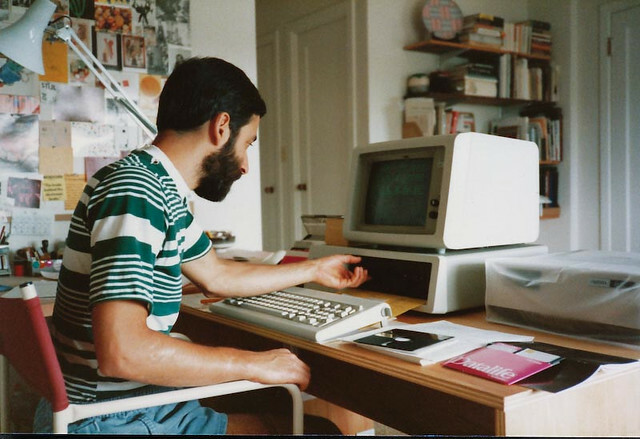 In mid-1984, Greg and I decided to go down to San Francisco to attend the West Coast Computer Faire. Greg was trying to drum up new subscribers to Programmer’s Journal and I was always up for a trip to San Francisco and I’d never been to a computer trade show which were relatively new. I don’t remember much about the trade show except that at some point I lost Greg and stumbled into Apple Computer, Inc’s booth which consisted of a fifteen foot 128K Macintosh with a projector in it such that a person operating a real Macintosh on a podium off to the side could demonstrate on it. The Macintosh had recently been introduced so it was new but the booth, amazingly, wasn’t all that crowded. The person running the demo was Andy Hertzfeld and much of the first Macintosh team was hanging out in the booth, including Steve Jobs who I recognized immediately. I watched the demo for a bit, then I walked up to Jobs and told him I was planning another trip to Alaska to work with adults with learning disabilities, I was taking twenty Compaq computers and I thought it would be great to have a Macintosh along so that we could see what LD adults could do with its mouse and graphical user interface. Jobs loved the idea, called Mike Murray over (Murray was the first marketing manager for the Macintosh at Apple) and told him to send me a Macintosh immediately. Jobs gave me his card (with AppleLink email address) and told me to get back to him with whatever happened in Alaska. I eventually found Greg and told him what had happened. In those days it was still possible to meet Steve Jobs in an Apple trade show booth and while it sounds amazing in retrospect, I did have small a sense of how important that encounter was. But, I had no sense of what was to come: my eventual migration from PC to Mac, starting the Eugene Macintosh User’s Group, presenting at numerous conferences for Apple on the Macintosh and LD in the next 6 months, moving to Connecticut to start the first Mac lab in the country for dyslexic high school students (with Apple’s backing), writing, editing, and publishing The Macintosh Lab Monitor with international circulation (also with Apple’s backing), meeting my wife at that school, continued consulting for Apple for the next twenty years, a few more meetings with Steve Jobs, many hundreds of workshops and presentations on the Macintosh in education all over the world, and much more. Julia and Richard after the Rooster Rock climb. Looking at these pictures of Julia and me on that climb brings back a flood of memories and what’s almost telescopic about it all is that the tool I’m writing this on and viewing the digital images on (a computer) is one that she helped lead me to and one that she and Greg were very early adopters of. They were both out in front of the digital revolution. I caught up fast but these two people were my introduction. Wherever you are Julia, thank you. You too Greg. Back in the day (1960’s) when Royal Robbins, Tom Frost, Chuck Pratt, Yvon Chouinard, Warren Harding and many others were putting up big walls in Yosemite Valley, Glen Denny was not only along for the ride but was photographing Yosemite climbing and culture. Anyone who’s read about this era in rock climbing history has seen Denny’s photographs in various books. Here they are online.